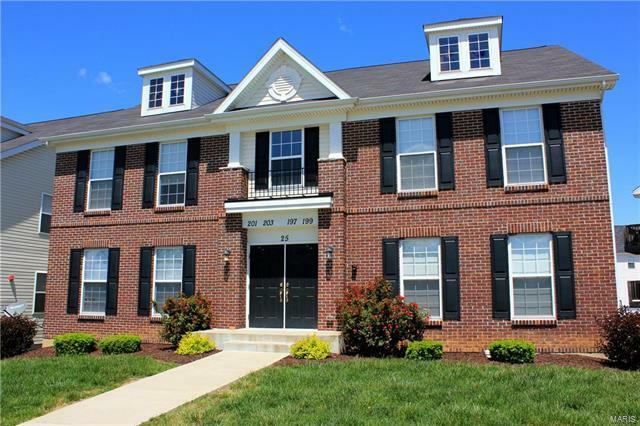 Spacious 2 bed/2 bath first floor Georgetown Park condo with 1 car over-sized garage and large storage space. The open floor plan features living/dining combo and a large kitchen with breakfast bar and stainless steel appliances (refrigerator, dishwasher, electric range, microwave). The master bedroom includes a full bath, walk-in closet, and sliding glass door to private balcony. The laundry room comes with washer & dryer. There is a large storage room (10x15) and over-sized (21'x11') 1 car private garage with opener in basement. This home is pet friendly with a $200 pet fee/pet and features a community dog park. Tenant responsible for electric and internet/cable. Security deposit equal to one month's rent. Hwy 40 West to Hwy N Exit. Right on Hwy N, Left on Henke, Right on Feise to Georgetown Park on Right. Building 25.